For nearly 14,000 years, Native people have lived at Waiekwakitchigami, the end of Lake Superior, which in French is called “Fond du Lac.” At the foot of the point of land called Neyaashi, now Minnesota Point, a short portage allowed Native people to pass from the shore of the great lake, Gichigami, into the bountiful estuary of Gichigami-ziibi, the outlet of the St. Louis River. Today, standing in the midst of the bustle of Canal Park watching ships pass, visitors to Duluth are unaware of the Native heritage of that location and the little portage, or Onigamiinsing, around which the city grew. It is the purpose of this website to share the deep history and continuing presence of Native people within Duluth. 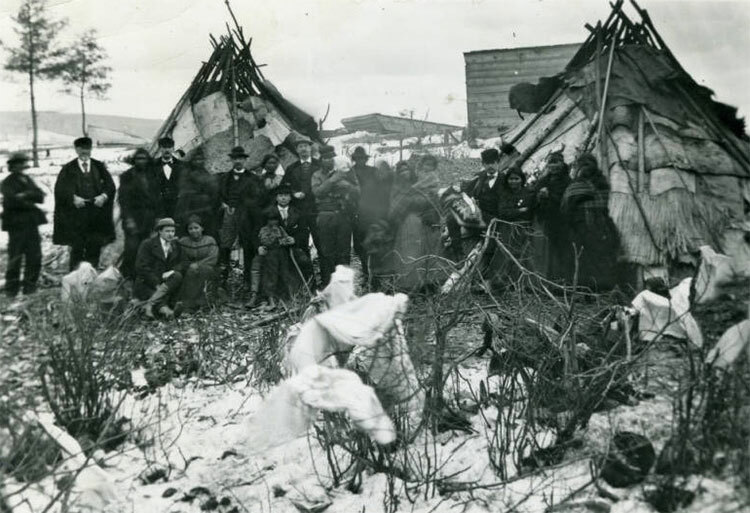 Ojibwe residents and white visitors to the village or one of the camps on Minnesota Point in the 19th Century. Photo from University of Minnesota-Duluth Kathryn A. Martin Library Archives and Special Collections. This website was created by the Fond du Lac Band of Lake Superior Chippewa in partial fulfillment of a Memorandum of Agreement for the demolition of the Carter Hotel in Duluth. The content of this website grew out of a previous ethnographic study completed for the Duluth Indigenous Commission in July of 2015 and which was made possible through grants funded by an appropriation to the Minnesota Historical Society from the Minnesota Arts and Cultural Heritage Fund. More about the report can be found here.